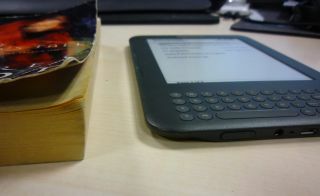 Amazon has created a new format for its e-reader, which it is calling Kindle Singles. While the name suggests that it is reading material for all the singletons out there, the format is more for bits of literature which aren't full-blown novels, neither magazine articles. Kindle Singles will be around 30-90 pages in length (10,000-30,000 words) and is for those texts which have added depth. "Kindle Singles will have their own section in the Kindle Store and be priced much less than a typical book," said Amazon in a statement. "Today's announcement is a call to serious writers, thinkers, scientists, business leaders, historians, politicians and publishers to join Amazon in making such works available to readers around the world." Amazon also explained that: "Kindle Singles will be 'Buy Once, Read Everywhere'," noting that "customers will be able to read them on Kindle, Kindle 3G, Kindle DX, iPad, iPod touch, iPhone, Mac, PC, BlackBerry, and Android-based devices." This is part of a whole host of new features for its Kindle Store, including the ability to write your own novel and get it published on the store.